If you have to migrate a complex Unity 3.x project to version 4 there is more than the SetActive change. See the list of issues I have found and their workarounds. Some of them are specific to iOS, some others are more general in Unity 4 (4.3.4f). I use Application.LoadLevelAsync to load menus and game levels, the latter most often additively via LoadLevelAdditiveAsync. I observed kind of freezing on iOS in most situations when I loaded a new scene that way. It took about 1-5 minutes to load a very simple scene on an old iPhone 4 with iOS 7.1 compared to < 0.5s on 3.5.7 but could not be reproduced in editor player. I found out that the problem occurs when Application.backgroundLoadingPriority is set to ThreadPriority.BelowNormal. Setting this to Normal fixes the problem. In version 3.5.7 I never noticed any difference between the distinct priority settings, so the implementation seems to be changed now. Some postings pointed out to set AsyncOperation.allowSceneActivation to true or false. But I didn’t realised any change of the behaviour when setting it explicitly. In RRRunner I used a special strategy to play foot step sounds. 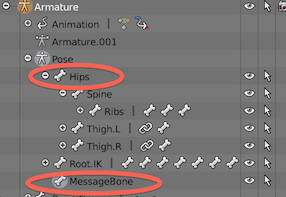 The character model has a special bone called MessageBone in parallel to to the regular root bone Hip. MessageBone’s X coordinate indicates within all animations which foot has contact to the ground e.g. X = 1 means left foot grounded, X = -1 right foot and X = 0 for both feet at the ground. The loaded level has a different lightmaps mode than the current one. Current: Dual Lightmaps. Loaded: Single Lightmaps. Will use: Dual Lightmaps. The reason was that I always load a LevelBootstrap containing level independent stuff needed in every level. As this level does not contain 3D objects it didn’t have a light map. While version 3 did never complain Unity 4 shows the warning. A dummy object in LevelBootstrap and a tiny lightmap made the warning disappear. These are related to MonoBehaviours that contain any methods like OnMouseDown, OnMouseEnter, … (s. all OnMouse* in MonoBehaviour reference). The problem was that there is no reliable hint where the code is located. So you have to use Find in Files. Most of them was contained in 3rd party vendor code, in my case GameAnalytics and others. It can be fixed temporarily by surronding it with #if UNITY_EDITOR. But after updating to a new version you might need to repeat this step if the code could not be removed by the vendor. So at least the select directory dialog and the append / replace popup don’t show up, but you still need to switch to Xcode and hit CMD + R over there. Alternatively you can define the hotkey in system settings but after restarting Unity it’s gone and you have to edit system settings again – a no go.